Arrowleaf Balsamroot along Ouray, Colorado, County Road 2B. These look a bit like Mule's Ears, but the leaves are different. Ouray County Roads 2 and 4 are open (see here for map). We’ve had quite a bit of rain and even snow over the last couple weeks, and it’s brought out the wildflowers. The road itself is mostly dry but rather badly rutted in places. My initial concern was whether the mudholes at the top of County Road 4 would be passable: they were, although still wet. The photo below shows the biggest mudhole, which is drying rapidly. The mud is the kind of gunk that sticks to your tires and makes for hard going. As shown in the photo below, the only easy way through is right at the edge of a rather precipitous drop-off. I made it fine. Ouray County Road 4 has this lovely mudhole near its eastern end. That's the nasty kind of mud that sticks to your tires. And, yes, the drop-off to the right is hundreds of feet to the bottom. Prairie bluebells, tiny little things. That's my gloved hand there. Lower aspens are getting their leaves as shown in this picture. Those higher up are still bare. I do want to caution you about ruts. 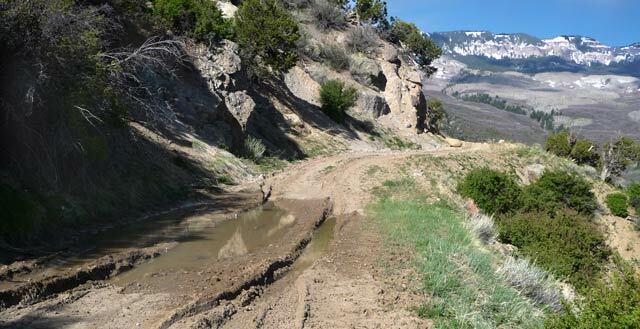 It’s been wet quite recently, and pickup trucks along these roads creates ruts which can take months to wear down. The ruts along County Road 2B are rather deep. That's my glove there for size comparison. Water from recent storms follows these ruts and washes them out a bit. 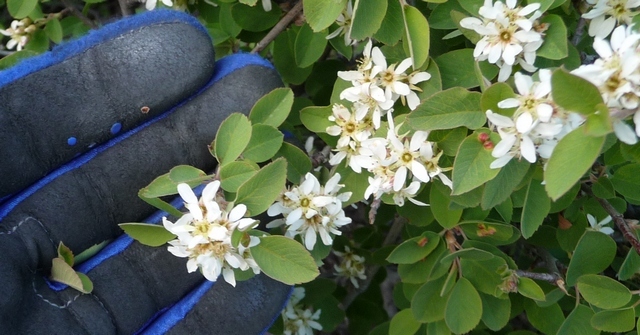 Here’s a lovely bush with white flowers not far from the ruts shown above. Flowering white bush along Ouray County Road 2B. Again, that's my glove for size. The bush itself is probably ten feet high. Lastly, let me show you what a difference a couple weeks makes. The picture immediately below was taken on May 3rd and shows a line of trees barely starting to leaf out. The picture below that was taken today—the trees are fully leafed out. Trees, May 3rd, at east end of Ouray County Road 2, just barely beginning to leaf out. This entry was posted in Motorcycling, Ouray County, Wildflowers and tagged Colorado wildflowers. Bookmark the permalink.